Tell us something about the recording process. In fact, this music was written and recorded in 2004. It was the first music project I did after ‘Curly’s Airships’, so it predates ‘The Full English’ and the ‘Live In Italy’ DVD. I’ve just been waiting for the right time and opportunity to get it released. It was also the first thing to be recorded in ‘Studio Judex’, my newly-built little digital facility that replaced my old analogue studio, so a considerable learning curve had to be climbed at the same time as doing the music. Hard-won skills at getting music onto reels of magnetic tape don’t really help that much when it comes to getting music into a computer. The music wasn’t simple to write, either. A skilled musician, with good equipment, can bash out a perfectly acceptable album of original ‘Relaxation Music’ in a day. It probably won’t be very good, but it will sound okay, and just like hundreds of others on the shelf in the New Age shop. I don’t have the skills to do that sort of thing, and I certainly wouldn’t want to try. In fact, the actual composing and recording of ‘The Vesica Massage’ took several months of serious work. Whatever the album is, it certainly isn’t a quick, knock-off, New Age pot-boiler. Was writing this music very different to writing songs? Not at all, really. 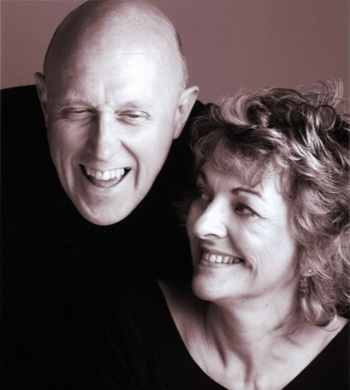 Once I’d established the ground-rules; very slow tempos, no big climaxes, no musical jokes, it was just like writing regular Judgemusic, with the same overriding concerns that I always have. I have to try and find the great tune, I have to try to make a pleasing and meaningful structure out of it, and above all, I must not be boring. Doesn’t Relaxation Music HAVE to be boring to do its job? Yes, I was worried about that, but I soon realized that something can be relaxing, quiet and tranquil, and yet still be fascinating. Take Japanese art, for instance. Just looking at that stuff is wonderfully relaxing, but yet it’s full of complexity and interest. Even at its most minimal and Zen-like, the work is never boring. Are you a Massage expert? No, but Fiona is. I just really enjoy being on the receiving end; and naturally I needed to have plenty of free Massage sessions to help me establish the fundamental rhythms and musical structures of the piece. Well, that’s what I told her! How did you go about making the sounds? All the soundscame from software instruments within the computer. Piano, strings, and voices are the basic sound-world, but this is the first project I’ve done where electronic sounds, that don’t resemble musical instruments, have also played an important part. I’ve never been very comfortable with synthesizers generally. The classic sounds of synthesizer music, as beloved by ‘progressive’ bands everywhere, have always left me cold, but in recent years, hybrid forms of synthesis have been developed, which take sounds from the real world as their raw material and then change them out of all recognition, and these kind of sounds appeal to me a good deal more. The problem with working with electronics is that modern synthesizers can make such an extraordinary variety of noises that there is too much choice, too many options. So, in order to create any sort of coherent sound-world for the piece to exist in, I had to limit my palate pretty strictly. I ended up using just two instruments; ‘The Grand’, by Steinberg, an elaborately sampled grand piano (which I played very softly), and ‘Atmosphere’, an extraordinary ‘dream synth module’ by Spectrasonics, that makes all the other sounds. During the mix, David Lord added a couple of little touches of extra strings, but basically that was it. How did the mixing go? It’s always a pleasure working with David, or ‘the Good Lord’, as he’s called on the credits of one album. He has a genius for making music sound big, and full, and smooth, and polished. He’s mixed any number of albums in this genre, including several CDs from New Age stars like Tim Wheater and Chlöe Goodchild, so I couldn’t have found anyone better qualified for the job. Intangible Healing influences from outside the material universe? Some people might think that you’ve gone a bit weird. But I’ve been completely weird for years! So, do you think of yourself as being ‘New Age’? ‘New Age’ is such a catch-all phrase that it doesn’t mean very much. Any point of view that falls outside the materialist scientific consensus, but which also falls outside the beliefs of the established world religions, can be said to be ‘New Age’, and that includes a vast number of different and often contradictory ideas. My own personal opinion is that the majority of these ideas are completely nuts, but I also think that there are some theories and practices, which seem to come under the ‘New Age’ umbrella, that are well worth taking seriously. I’m personally very interested in the phenomenon of Healing, for instance; how it works, why it works, the true nature of the Placebo Effect, and so on. Does the music on this CD have some mystic Healing energy? No way! This isn’t one of those phony albums that claim to reprogram your DNA or re-balance your chakras. However, it would be true to say that any piece of music can have a profound mental and spiritual effect on the listener. Music can bring you up, or it can get you down. Furthermore, it would also be true to say that music which is intended, by the music-maker, to make people feel good, will undoubtedly have a more positive effect on the listener than music that isn’t. And music that’s intended to make people feel bad (and there’s a lot of that around) can be highly effective at doing just that. I believe that the intention of the music-maker is as powerful as the actual notes and sounds themselves in determining what effect the music is going to have on people. So enjoying the album doesn’t involve buying into any weirdy mumbo-jumbo. 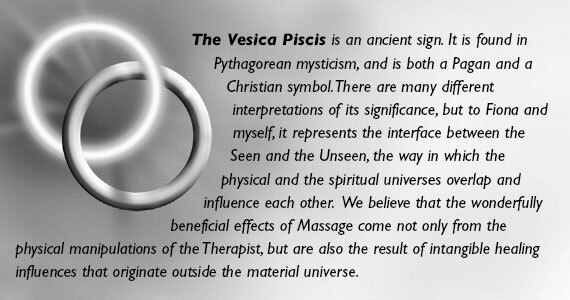 The most hard-line, skeptic materialist can enjoy a great Massage, or simply enjoy chilling-out to relaxing music, and ‘The Vesica Massage’ would suit them fine. No mystical flim-flam is involved. Are you happy with the way it came out?